They have a lot of cool stuff for kids. I like the Travel Toy Tote by Alex. Please email me to claim your prize! Little Jet Set specializes in travel gear for kids and they offer almost anything you could possibly want to make your holiday trip with kiddos in tow go smoothly. I love their collection of kid-friendly luggage, airplane and road trip accoutrements. But don't assume you can't enjoy Little Jet Set at home, too! They have a great selection of toys and games for holiday gift giving whether you're a globetrotter or a homebody. We got to try two of Little Jet Set's best offerings for creative kids. 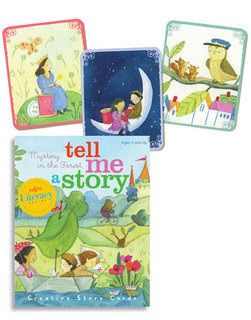 First up, the Tell Me A Story Mystery in the Forest cards by eeBoo. eeBoo is known for its remarkable illustration work and this game is no exception. The concept behind the Tell Me A Story is great: each sturdy, heavy-duty card has a full-color image and your child uses them as a starting point to illustrate his or her own story. This is a fantastic alternative to all of the bells and whistles on most contemporary toys because it fosters imagination and narrative ability. Roo, being naturally loquacious, loved it immediately! There are other themes in eeBoo's Early Learning Literacy series, including LIttle Robot's Mission Tell Me A Story cards and the Write Me A Story line, which encourages kids to keep their stories for posterity. 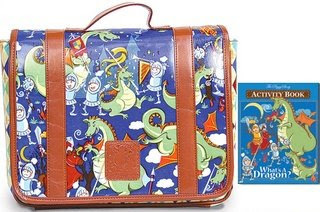 We also received the What's A Dragon Art and Activity Backpack by The Piggy Story. This is a well-appointed backpack for little doodlers, complete with a ten-piece double-sided washable marker set, activity book and doodle pad. All of The Piggy Story products feature signature prints that are absolutely adorable. This dragon set is perfect for Jasper while the Pretty Princess Art and Activity backpack is more in tune with Roo's pink-lust. I love how there is a place for everything in this backpack, including slots for the pens and a removable pouch for other supplies that tend to fall to the bottom of a bag. The laminated finish make it very durable and easy to clean, too. I also love the Doggy Diary print… I just wish they had a corresponding kitty print! Maybe on lavender. Hint, hint. 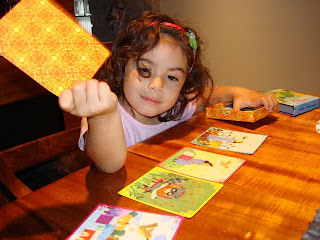 To enter and win your own What's A Dragon Art and Activity Backpack by The Piggy Story or Tell Me A Story Mystery in the Forest cards, please comment on this post with your favorite item from Little Jet Set. Entries will be accepted through November 12th and I'll pick the winner using Random.org. US readers are eligible. Only one entry/comment per person, please. I love My First Amazing Game Board Book by innovativeKids. I could see my son getting really into it. They had so many great things to choose from, but I really liked the Chocolate Poppy Phoebe Diaper Clutch by Cricket & Monkey. It seems like that would be very handy, when traveling or even just around. I love Little Jet set, especially their adorable kid luggage. You have to get the Jappy Jump Rolling Suitcase by sigikid for Roo's little Jappy! My favorite is the Alex Car Valet and also the Doggie Diary Ramblin' Kid Suitcase. Thanks for another great giveaway Naomi! I love the The Wheels on the Bus: A Felt Read and Play Kit from Chronicle Books! I love the Biscotti Secure 2 Me blanket. Too cute! Great items! i like the mix and match travel outfits, particularly the tangerine and grey one. Very nice! The Count and Sort Tote by Manhattan Toy would be great to break up the monotony of a long car ride. I also like the Fun With Felt by Chicken Socks. I love the Doggie Diary Ramblin' Kid Suitcase Sleep Set. Thanks for the great giveaway. I love the lap desks and the lacing cards. I've been looking for some new lacing cards to keep the "baby" occupied during church services. These look perfect! Ah, it was hard to choose... but I do love the prince icon diaper envelope... the little embellished prince is ADORABLE! I like the write me a stories, especially the space one! I like the baby zoobies- so cute! I like the fairies of the field lacing cards! My favorite is the Bingory by Blue Orange Games. Can never have enough games. I hate to see my son's head bobbing around whenever he falls asleep in his car seat, so I'm really liking the Dinosaur Travel Pillow by Li'l Lewis. Thanks! I love My First Games by Latitude Enfant. I like the map of the world sticker set. My son would love that! I love the Croc travel pet and also the doggy diary crayon caddy. So cute and useful! Bugs First Puzzle by Mudpuppy -- fingers crossed. i like the cow play blanket by mud pie. My kids would have a lot of fun with the Crayon Rubbings book/art set. Very cute! Thanks for the chance to win, please throw my name into the hat! I love the Hada Hippo zoobie pet. The zoobies are so adorable! I love the dress up Pirate. He's adorable. Thanks for the giveaway! I really would love the tell me a story the best, but since I had to pick something else well, I like the Zoobies and Neck pillows, they are all so cute! Bendomino looks great to me! they have so many neat products! I like the backseat survival kit! I like the Friendly bugs Lacing Cards. I really liked the At the Airport Sticker Set. I think my boys would both love that! Thank you for the chance to win the What's A Dragon Art and Activity Backpack my son would love it. He has a thing for dragons. :) Although after looking at the site I think he would also like the Dinosaur Cards. He always wants to play cards with us. I love the travel neck pillows, so cute! Too many cool ideas - but a back seat survival pack is great! Anything that takes up time is perfect! I just love and adore the zoobies! My girls would love the magnetic princess doll set! I like the I spy travel book. Great idea! the monsters magnetic figures are really cool! i like the twins wooden matching game. my girls would get a kick out of it! I like the ramblin kid cow print suit case set...amongst many other neat stuff. Hope to win. I love the little kid backpacks. Both the Dino and the monkey are adorable! Car Valet by Alex is my favorite. My favorite is the Alex Car Valet. I think the doodle all year book is cool. I like the Orazio the Orangutan 3-In-1 Travel Pet by Zoobie Pets. My middle schooler is kinda' old for it but she collects monkey and ape things. I didn't have to look far at all. It's one of the new products and I love him, the Orazio the Orangutan 3-In-1 Travel Pet by Zoobie Pets. Thanks so much for hosting this giveaway. I like Short Stuffs by Chicken Socks. The Doggie Diary Ramblin' Kid Suitcase Sleep Set is cute. Thanks for the giveaway! 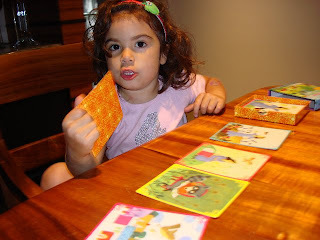 I love their wooden memory game! Little Jet Set has the greatest products at reasonable prices! My favorite is the cool Double Shutter Jr. by Blue Orange Games-it looks like a lot of fun! I am subscribed through Google! I love teh zoobies and teh kid's travel pillows! One of my favorites is the Backpack Tray Table Playmat (Princess Adventure). These products are all so cute & clever! I am subscribed via email! I like the ocean activities cube! I like the More Things That Go Lacing Cards by eeBoo. I like the Where's The Bone Activity Book by Manhattan Toy! Thanks for the chance to win!!!! I really like the Navy Stripe Lap Desk by Room It Up- I like how there is a built in cup holder and how the bottom isn't hard it would be nice for traveling or for at home! I love the Animal ABCs Ring Flash Cards by Mudpuppy. They would be perfect for our 3 year old daughter! The dog travel pillow looks great! We go on a 17 hour car trip every Thanksgiving so my daughter would love this. Thanks! The Car Valet by Alex looks like it could keep my kids busy in the car for awhile!! I like the Ultimate Boat Tote (Med.) by Dante Beatrix. I love the Travel activity Kit. We travel alot so this would be great for my boys! I like the Tree with Bird by Latitude Enfant. I am a subscriber via RSS! I love the Trixie the Trunki. What a great way to get my little one through the airport. We absolutely love Lencho the Lion from Zoobie Pets! I like the Pink Plaid Lap Desk by Room It Up. I love the Once Upon a Time travel matching game, but am also planning on getting my daughter the tell me a story cards for Christmas. Her imagination is just starting to bloom and I would love to see what she comes up with! I really like the Write Me A Story Circus Animal's Adventures by eeBoo. The Tell Me a Story and Write Me a Story items are so neat. I really like the Ocean Activity Cube by Manhattan Toy. What a great prize. 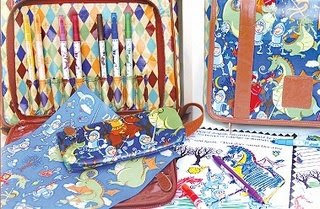 I also love the Piggy Fairy Art and Activity Backpack by The Piggy Story. This site has some really wonderful items. Thanks so much for this giveaway. I like the Doggie Diary Ramblin' Kid Suitcase Sleep Set by The Piggy Story. It's cute! Let's go with the Cow Print Ramblin' Kid Suitcase Sleep Set by The Piggy Story. I know my kids would enjoy the Zip and Zoom First Puzzle by Mudpuppy. Thanks! I like the Orazio the Orangutan 3-In-1 Travel Pet by Zoobie Pets!! I like the Eye find game. Travel Bingo by eeBoo!!! I used to play travel bingo as a kid, would love to get it for my kids! i like the zoobie pets. I bought the monkey zoobie for my niece and my son has been begging for one ever since. The little nech pillows look comfy! I adore the Piggy Fairy Art and Activity Backpack! So cute. We like the count and sort tote by Manhattan Toy. It looks just right for my daughter. And so do the Tel Me a Story cards.What a great idea. Orazio the Orangutan is so cute!!! I'm following you in my reader. Baby Kojo the Croc 3-In-1 Travel Pet by Zoobie Pets would be Holt's favorite. My daughter would love the Pretty in Pink Art Folio by The Piggy Story. Thank-you. I like the sports nap pack by crafty baby. It would make traveling so much easier in that it all hooks together. The Doodles book looks like tons of fun! great selection, the Twins Wooden Matching Game looks like a lot of fun! My favorite is the Norby Norway Rolling Suitcase by sigikid. The fairies of the field lacing cards would be great! Thanks for the giveaway! I like Construction First Puzzle by Mudpuppy. I love the Car Valet by Alex! I like the Trixie the Trunki. Thank you for the nice giveaway. I love the Pirates Sticker Set Play Scene by Mudpuppy. Thanks for the chance! My children would love travel Bingo. We visit Grandpa in the next state over frequently and this would be wonderful! I would love to be able to give the dinosaur art set for my son for Christmas. Another product I like is the Cowprint Art Roll. Thanks! Favored you on technorati. Id: lethallyblonde. Thanks! My favorite is the On the Go Block Puzzle by Mudpuppy! I subscribed to your feed! My Kids would like Made You Look-A Book of Puzzling Pictures by Klutz, thanks. I like the Travel Bingo games a lot! I LOVE the Green Shine Toiletry Bag! Toiletry bags for kids!?!?!? AWESOME! I love the liitle kid backpacks especially the monkey. Very cute! Thanks for the giveaway! I love the gator play blanket!! Thanks so much! I love Kojo the 3-In-1 Travel Pet by Zoobie Pets. I am in love with the Spring Fling lil diva Valise Sleep Set!! its the most adorable thing I have seen in the longest time and is perfect for my lil girl!! thanks for all the great products, im thrilled to have found this site!! The products are top notch. Backpack Tray Table Playmat (Aero Playin') by Portable Playtime is my favourite - I THINK! My husband contracts to the military and so to visit family in different states we have to fly at least three times a year - so many of these items would be helpful. I was looking for a print catalog but didn't see it.Thanks for calling everyone's att'n to this site! My daughter would love the Kojo the 3-In-1 Travel Pet by Zoobie Pets. They are so cute! Well, I have a little guy who loves the gorillas in the Pac Man game we have. So I think he would love the Zoobie Gorilla. As for this contest, the dragon backpack would definitely win the heart of my young knight. One of my favorites is the Car Valet by Alex. I like the Baby Ellema the Elephant 3 In 1 Travel Pet by Zoobie Pets. My favorite is the: Travel Toy Tote by Alex. I like the Green Travel Neck Pillow by Belle Hop. Backpack Tray Table Playmat (Enchanted Journey) by Portable Playtime is my fave- this would be great to take when we bring Asia to Orlando in April.